*Macklemore is known for promoting non-discrimination and non-hate in his music. So it makes no sense he would wear an anti-semitic costume to a performance! And that’s what the rapper is being accused of — anti-semitism. The performance was Friday night at the Experience Music Project Museum. 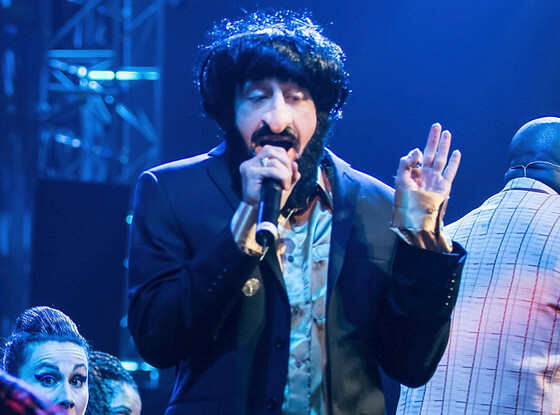 Macklemore wore a bowl-cut wig, huge nose and Hasidic-looking beard. “A fake witches [sic] nose, wig, and beard = random costume,” he wrote. “Not my idea of a stereotype of anybody,” he tweeted. But that didn’t stop the controversy or him even being joked about by others on Twitter. Actor Seth Rogen made a joke out of the situation. “Macklemore, first you trick people into thinking you’re a rapper, now you trick them into thinking you’re Jewish? Back in April 2013, a fan asked Macklemore if he was Jewish. “Nah. Just got hella good Jewish homies,” he replied on Twitter. The “Same Love” rapper continued to dismiss the accusation his performance was meant to be anti-semitic in a statement on his website. “There is no worse feeling than being misunderstood, especially when people are hurt or offended,” he wrote. “On Friday night we had a surprise show at the EMP Museum in Seattle. Earlier in the day I thought it would be fun to dress up in a disguise and go incognito to the event, so that I could walk around unnoticed and surprise the crowd with a short performance,” he added. But he admitted he saw controversy ahead of him before the performance. Nevertheless in his Characters Unite PSA released earlier this year, he encouraged folks to not stand for hate, bigotry and discrimination.